Today I am here with a new travel post from Lucerne/Switzerland. I visited Lucerne last year when my sister started her school there and I fell in love with this city! Since it was autumn and the weather was pretty bad, I knew that I had to come again and explore this place in its summer-beauty. That is why I made a collaboration with a Grand Hotel National which is for sure the prettiest hotel in Lucerne and offers the most spectacular overview of the entire Lucerne lake. If you plan on visiting Lucerne I recommend doing it during spring or summer in order to have a complete experience. There is so much I could write about this beautiful city, but this post would be so long if I started writing about all of its treasures. 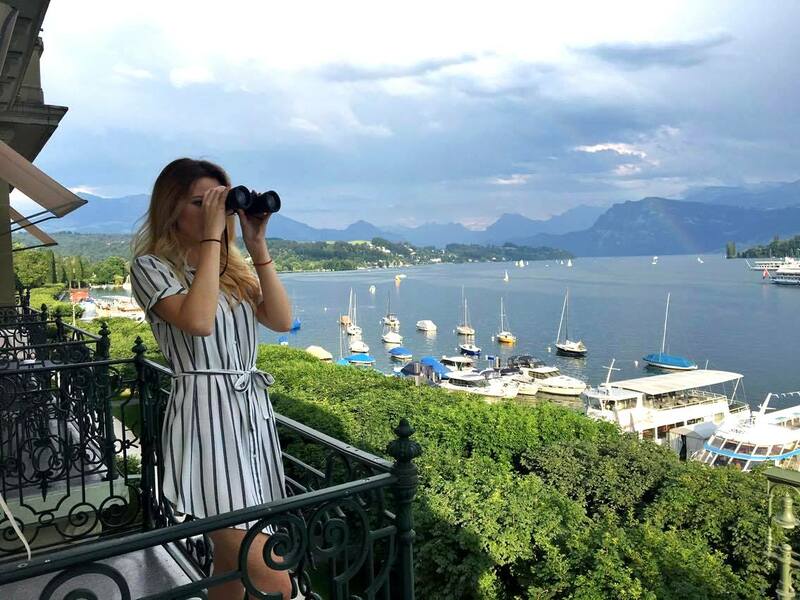 Also, you can find out about its most famous landmarks everywhere on the internet and that is why I decided to show you Lucerne from my point of view. All of the photos below are representing a bit of magic in this city. I like to find that magic in little things, cute houses, food, water and animals rather than monuments and statues (which also have their beauties, don't get me wrong). 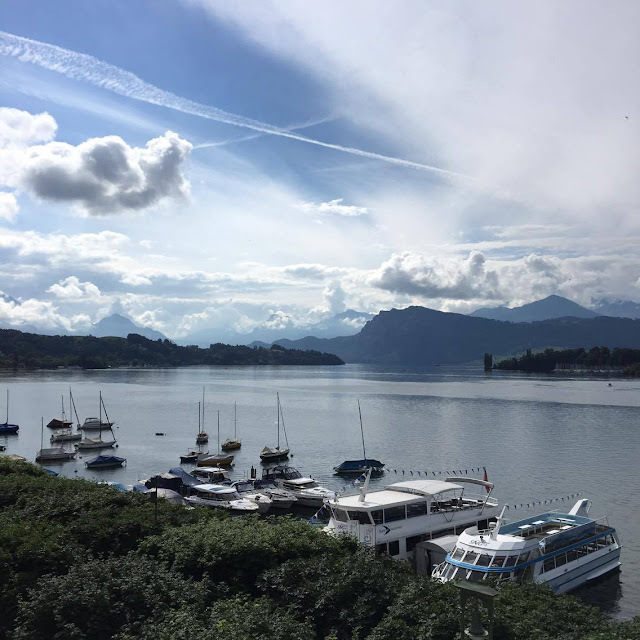 I hope you enjoy these photos and feel a touch of Lucerne sparkle! Toliko toga bih mogla da napisem o ovom divnom gradu ali u tom slucaju bi ovaj post bio predugacak. Takodje, sve o glavnim znamenitostima Lucerna mozete pronaci na svakoj stranici na internetu, zato cu vam ja predstaviti ovaj grad iz svog ugla. Na fotografijama koje cete videti pokusala sam da ,,uhvatim'' malo magije ovog grada. Volim da pronalazim tu magiju u malim stvarima, slatkim kucicama, hrani, vodi i zivotinjama radije nego u statuama i spomenicima (koje takodje imaju svoju lepotu, nemojte me shvatiti pogresno). Nadam se da cete uzivati u ovim fotografijama Lucerna i osetiti malo njegove magije! Grand HotelNational is a traditional 5-star-hotel located in the heart of the city on the shores of gorgeous Lake Lucerne. The hotel was founded 150 years ago by the famous Cesar Ritz and Auguste Escoffier. Today, the hotel offers 41 roomsand suites, 22 residences, ultra-modern offices, 6 restaurants, 2 ballrooms, conference rooms and a pool floor with sauna. What I loved most about it is the beautiful architecture which takes you back a few centuries into Italian Renaissance. If there wasn't for tablets, flat screen TVs and sound system in every room, you would think a time machine was finally invented. Actually, the true beauty in this world represents exactly that- a combination of tradition, history and modern facilities. Grand Hotel National je tradicionalni hotel sa 5 zvezdica koji se nalazi u srcu Lucerna na samoj obali Lucernskog jezera. Hotel je osnovan pre 150 godina od strane poznatog Cezara Rica i Avgusta Eskofiera. Danas, hotel nudi 41 sobu, 22 rezidencije, moderne kancelarije, 6 restorana, 2 svecane sale, sale za konferencije i bazen sa saunom. Ono sto se meni najvise dopalo jeste arhitektura koja vas vodi par vekova unazad u doba renesanse. Da nema tableta, televizora i sistema za ozvucenje u svakoj sobi, pomislili biste da je vremeplov konacno konstruisan. Zapravo, prava lepota, po mom misljenju, je upravo u spoju tradicije i modernog. Breakfast deliciousness and breakfast restaurant!